Ah, Underworld. A story with a dodgy reputation based mainly (from what my aged & addled mind can remember) on the over-use of CSO making it look rather cheap & nasty. In truth it isn't as bad as its reputation suggests. The story is pretty much a Whoed up version of Jason & the Argonauts with a team of Minyan's led by Jackson (James Maxwell) on a quest to recover their lost race banks from a lost ship, the P7E. 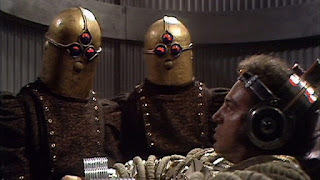 The Minyans it turns out were given a technological leg up by the Time Lords long, long ago but it all went horribly wrong. The Time Lords were driven out & the Minyans destroyed their own world. It was the fate of Minyos that led the Time Lords to introduce their policy of non-intervention. Episode one is pretty good. The Doctor's arrival is greeted with some concern by Jackson & lots of shouting by Herrick (Alan Lake). The other Minyan's are Orfe (Jonathan Newth) & Tala (Imogen Bickford-Smith). They've been on their quest for one hundred thousand years apparently & looked a pretty tired bunch. It turns out though that Minyan's can regenerate...well actually it is more of a rejuvenation. There's none of the complete physical change that comes with Time Lord Regeneration. They just seem to be younger versions of themselves. There are some nice design touches too: the shield guns; the Minyan ship interiors & exteriors. There's also the rather lovely 'pacifier', which I wish we'd seen more of. The effect it has on Leela in particular is amusing. The rest of the story isn't quite up to the standards of Episode One as the Doctor & Co find themselves wondering CSO caves; dealing with a rag-taggle bunch of 'Trogs' whose wetness rivals the Xerons & coming up against various guards, Seers & finally the Oracle. It's not entirely clear what the Oracle is but it seems to be another in the long line of sentient computers - P7E's computer perhaps - having a metal breakdown. The Seers are robots. Again praise must be given. This time for the costume design, which is pretty imaginative (with the exception of the Trog's rags & the Minyan's silver spacesuits). The Seers in particular are a bit on the unusual side design-wise. It's a visually interesting story in many ways. The CSO - usually known as 'blue screen' these days - isn't quite as awful as I'd expected it to be. It doesn't quite work but it doesn't look horrifically awful often. One of the times it does look bad is when the Doctor, Leela & Idas (Norman Tipton) are drifting down a zero gravity tunnel. I'm afraid to say that whilst both Louise Jameson & Norman Tipton are doing their best to look like their feet aren't touching the ground Tom Baker kind of slouches his way down. It's very Tom but it doesn't help make things look convincing. There's no great performances. Alan Lake's Herrick is a bit Brian Blessed for my liking, Norman Tipton's Idas is weedy & wet (a bit like Cordo in the Sunmakers but he never quite breaks out of the wet), James Maxwell & Jonathan Newth don't get a lot to do but heroism & Imogen Bickford-Smith gets to be pretty & heroic. How much of this is down to the stress of making a story is a moot point. We often forget, sitting here thirty years plus later, that when this story was made UK inflation was c.15%. That meant that budgets set at the start of seasons were sucked dry by the spiralling costs that came with such high rates of inflation. It tended to affect the final stories of seasons in particular (where there was less room for manoeuvre). So when it became clear that the budget for Underworld couldn't stretch to cave sets then the production team was required to do some lateral thinking & then make extensive use of a technique we now take for granted in film making (CSO/Blue Screen) to cover for the fact that the budget wasn't there. It doesn't quite work but you've got to admire the effort. In the end it's not the first Tom Baker story I'd reach for & I enjoyed it more than I did 'The Invisible Enemy' (which is enjoyable in a different way) for example so it's probably reasonable to suggest that if you haven't seen it or you've been avoiding it due to its rather unfortunate reputation that you dig it out a take a look for yourself.